Welcome to this video on the six physical forms of digital data. Digital computing involves using electronics to represent the 1's and 0's of binary, the base 2 counting system of all digital data. Pulse waves are used because they are ideal for representing the on/off states of binary bits. 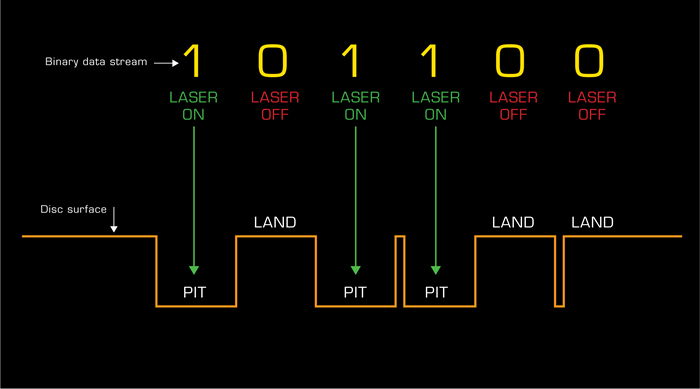 When a binary electrical pulse wave signal arrives at a RAM, FlashRAM or ROM memory module, or at a solid state drive, or at the CPU, the on/off states of its wave cycles are translated into on/off positions of millions of switches. These switches, which take the form of transistors, temporarily store the binary values..
On the surface of a hard disc drive, or a tape drive, 1's and 0's are recorded as a pattern of strong and weak magnetic pulses. In the case of optical discs manufactured at a pressing plant, such as CD's and DVD's, a master disc is created from which copies are made. The master is created with a laser which turns on and off according to the data to be recorded. When the laser turns on (when a 1 is sent to it) it burns a so called "pit" into the surface of the master. When it is turned off (when a 0 is sent to it) no pit is created. This area is called a "land". A number of glass masters are made from the first master, and these are used to duplicate the finished product. CD-R & RW and DVD-R & RW work differently, by using a laser to change the colour of a light sensitive dye which is spread across the surface of the disc. A reading laser differentiates between the wavelengths of the coloured dyes to recover the 1s and 0s. 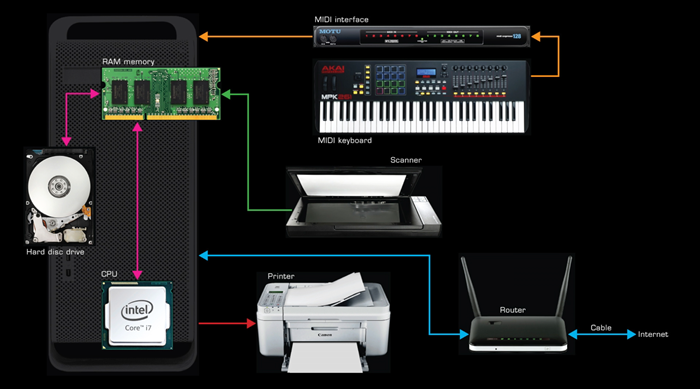 Binary 1's and 0's can be transmitted over a wireless network in the form of radio waves. This is how wi-fi and the cellular data networks work. Binary 1's and 0's can be transmitted down an optical cable in the form of pulses of light. This is how the TDIF and ADAT formats work. We suggest you subscribe at our YouTube channel, and join our mailing list at our website to receive notification of new videos, blog posts and subscriber only extras.